Acting can be a positive and life-enhancing experience, particularly for children. Here are just 5 of the many ways in which acting can boost a child’s self-confidence. Acting helps children to realise their potential. A great sense of accomplishment is achieved through crafting a production over time. This might be reflected in other aspects of life too having developed confidence in their capability to achieve goals on the stage. Acting can help children’s reading comprehension and listening skills through drama activities and script learning and analysis. The enhancement of these skills when rehearsing and performing will also improve a child’s confidence in the classroom. 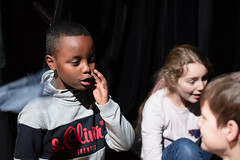 Acting provides a rare opportunity for self-expression and allows children to find out more about themselves by working freely with their minds and bodies. Listening to our inner instincts and then being able to express them can naturally help us to believe in ourselves. Acting requires you to flex and project your voice. Practicing speaking aloud in front of others can help to develop essential skills for delivering talks, presentations and speeches in later life, and give children confidence in their own voice and opinions. Starting a new hobby offers the perfect opportunity to make new friends and what better way to do this than joining a theatre group! Not only does this give you the chance to meet new people with similar interests but your fellow actors will help to cheer on your successes and support your efforts to grow. Friends can see strengths in us that we can’t recognise as well as giving us the encouragement to do better and to try new things. When I go to the theatre on Saturdays it always feels as if I am coming home to a huge family. It simply is a place where you feel at home and are free to express yourself in every way you want. Prague Youth Theatre, established in 2011, is designed to give young people the chance to act in full-scale productions, and provides an opportunity for children and young adults to develop a shared sense of confidence, commitment and self-expression.